In my recently released version V1.3 of the B&W Artisan Pro panel for B&W editing I’ve created, there is a novelty I would like to give you some more insight in as it is an essential part of editing photographs with a higher degree of luminance separation and hence control. Even though the panel automates every single step in my workflow, I believe in sharing information that will be of added value for every serious photographer in the digital age. The novelty that I built into the panel is a variation and combination on the luminosity masks and zone masks Tony Kuyper, the inventor of the luminosity masks, is suggesting on his website and are called asymmetrical masks. Basically zone masks are asymmetrical masks, but I found a way to make the asymmetrical zone masks more accurate and at the same time with the full depth of 16 bits, when compared to the usual zone masks. I will try to explain in this article what asymmetrical masks exactly are and how to create them yourself with 16 bits depth. Let me start with the discussion on 16 bits luminosity masks versus the more ubiquitous 8 bits luminosity masks. The practical effect and benefits of using 16 bits luminosity masks instead of 8 bits luminosity masks are negligible and only visible when pushing the contrasts/adjustments to extremes. One reason for this is that channel masks that can be created in 16 bits, in this case luminosity masks, are only practically useful when they’re loaded as selections. 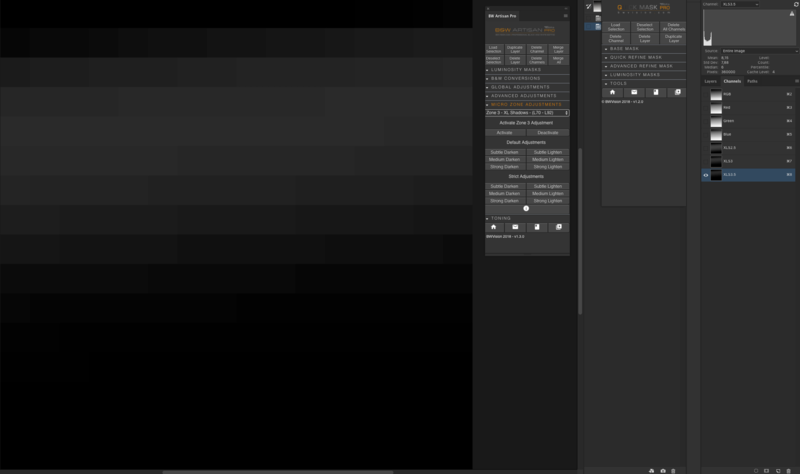 Selections in Photoshop are always 8 bits. So this mitigates the effect of the full channel depth of 16 bits. An important feature in the B&W Artisan Pro panels have always been the use of micro zones to adjust tonal values using free form selections within a specific tonal range. 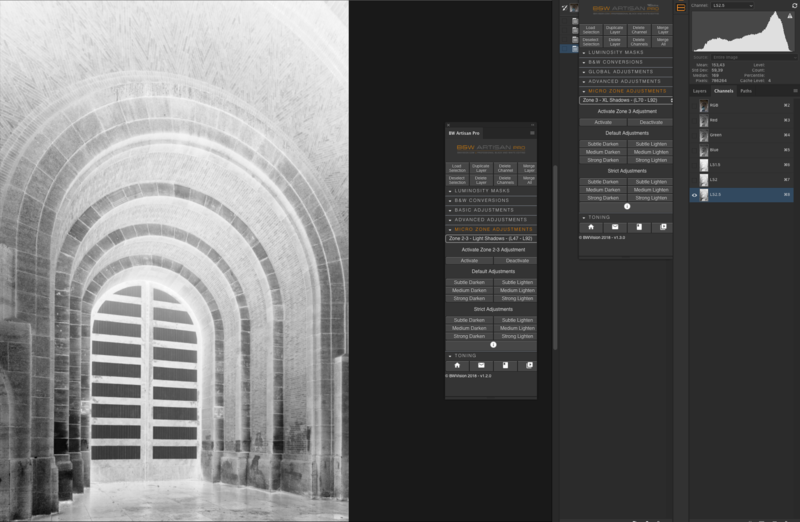 Up to now I’ve always used standard, linear, luminosity masks, including symmetrical mid tone masks, automatically generated when hitting a preset in the panel, to enable a feature like micro zones. Since linear luminosity masks (why they’re called linear will be explained in this article as well) work only well to isolate a specific tonal range or zone when they’re at the opposite ends of the grayscale, zone 0 or zone 10, and do not isolate a targeted zone exclusively when trying to isolate zone 8 for example, the solution would be in a non-linear symmetrical or asymmetrical mask. 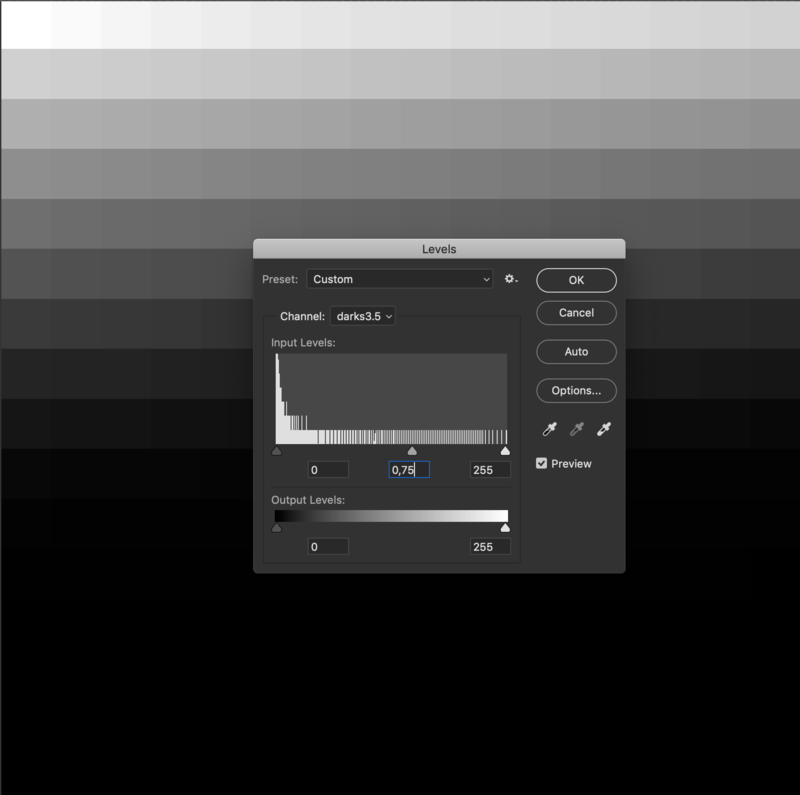 Conventional luminosity masks like Lights2 or Darks3 are linear masks. 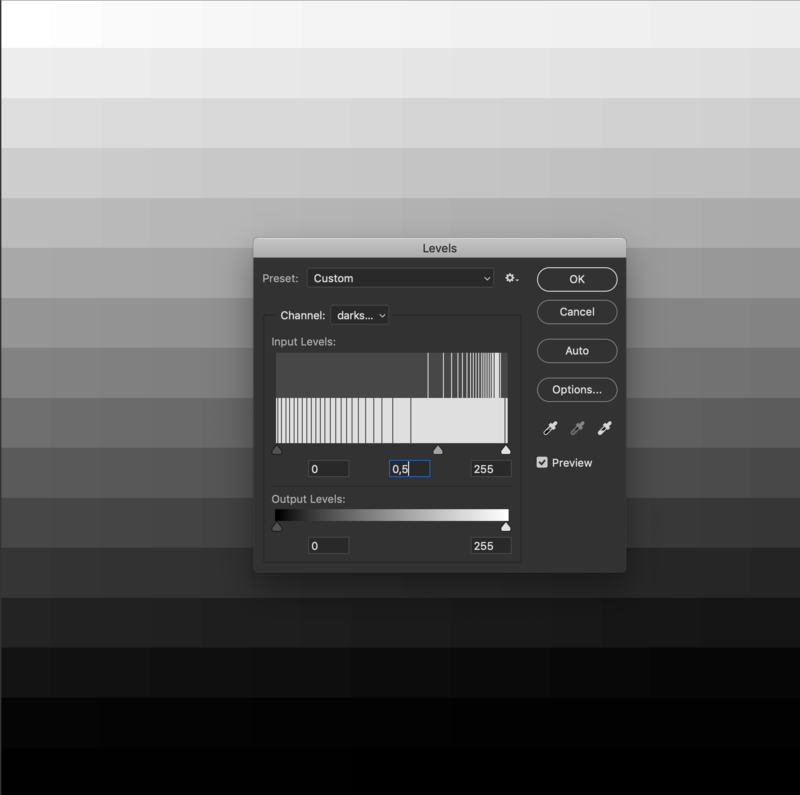 A luminosity mask created for mid-tones is symmetrical as it is intended to exclude the highlights and shadows. A variation on luminosity masks are the zone-masks that also have been developed by Tony Kuyper and are asymmetrical as they target only a specific zone, while excluding other zones. See the following pages for examples of the asymmetrical masks used in this panel and how they differ from conventional, linear, luminosity masks. 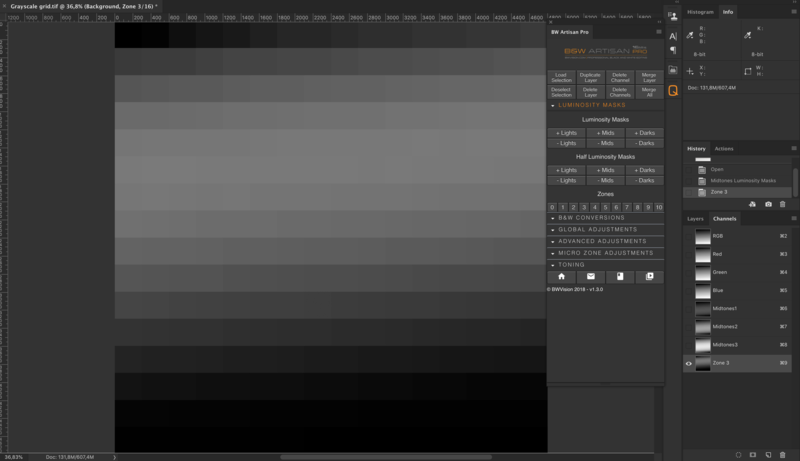 Grayscale grid – to explain what asymmetrical masks are, I’ve created this grayscale grid where every luminance value from L0 to L255 is represented together with the Zone they’re in. The darkest value L0 in zone 0 is in the upper left corner, the lightest value L255 in zone X is in the bottom right corner. Zone 0, the dark shadows are therefore in the top row and a half, and zone 10 with the highlights are in the bottom row and a half and all other zones in between those extremes. 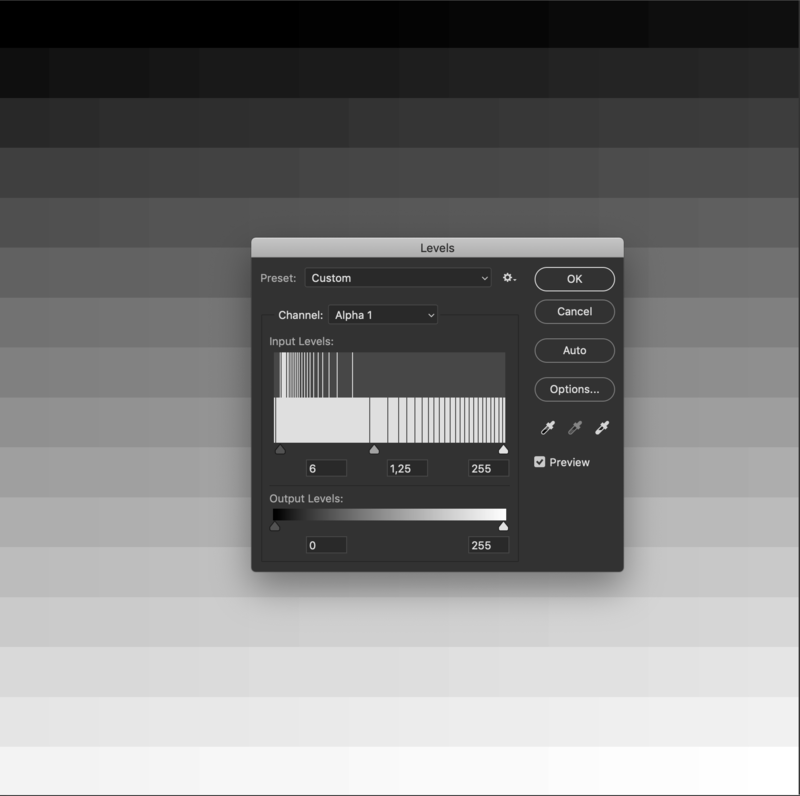 Linear mask – this is how the conventional luminosity mask, in this case Darks2.5, looks like when applied on the grayscale grid from above. The lightest zones are excluded while everything from roughly zone 7 and darker is included, while zone 0 has been included the most (are the lightest). It has a linear pattern. A lights2 mask would show the opposite pattern. If the objective here was to isolate zone 2 for example, then this would automatically also include, all adjacent zones like zone 3 but especially zone 0 and zone 1. Symmetrical mask – this is how a mid tone luminosity mask, targeting zone 5 looks like: it blocks out zone 0 and zone 10 and has its lightest area around zone 5, according to the initial grayscale grid. However, all adjacent zones to zone 5, like zone 6, 7, 8 and even 9 and parts of zone 10 are also included and not completely blocked out. Same for the darker tonal zones than zone 5. Asymmetrical mask – this is an asymmetrical mask, targeted at zone 3. It’s a zone mask built according to an algorithm that Tony Kuyper propagated. As can be seen, zone 0 is not completely excluded (first row), while zones 1 and 2 (second to fourth row from the top) are partially and increasingly included. Zone 3, rows 5 and 6 are included. The lighter zones 4 to 8 (fourth row from the bottom) are also decreasingly included. Asymmetrical mask customised – this is an asymmetrical mask, also targeted at zone 3, but this time I developed a custom method to isolate zone 3 more accurately, yet without any abrupt transitions to adjacent tonal zones. The mask is much darker to ensure the exclusion of adjacent, not targeted zones, while still maintaining proper and subtle transitions to adjacent zones. This time all other zones, apart from the directly adjacent zones are completely excluded. The directly adjacent zones are included to a lesser extent than with regular asymmetrical masks. Further down this article I will describe how to create one such custom asymmetrical mask for 16 bits. Linear luminosity mask Darks2.5 – The areas in blue (zones 0 to 2) are also included with this regular (linear) luminosity mask. To a lesser extent the zones lighter than 3 are also included. Click on the photo to enlarge. Custom built asymmetrical mask XLS3.5 (generated when zone 3 in panel is activated) – The areas in blue (zones 0 to 2) are not included. The zones lighter than zone 3 are not included either, and some adjacent areas (zone 4) are less included than with the linear masks. Hence more accurate and isolated adjustments are enabled now. Click on photo see it larger. The following method I’m describing targets just one zone, zone 3 from the example, and it’s a method that will ensure a 16 bits channel mask. It’s an alternative method based on calculations and adjusting straight on the channel mask with levels adjustments to avoid loading the mask via selections. 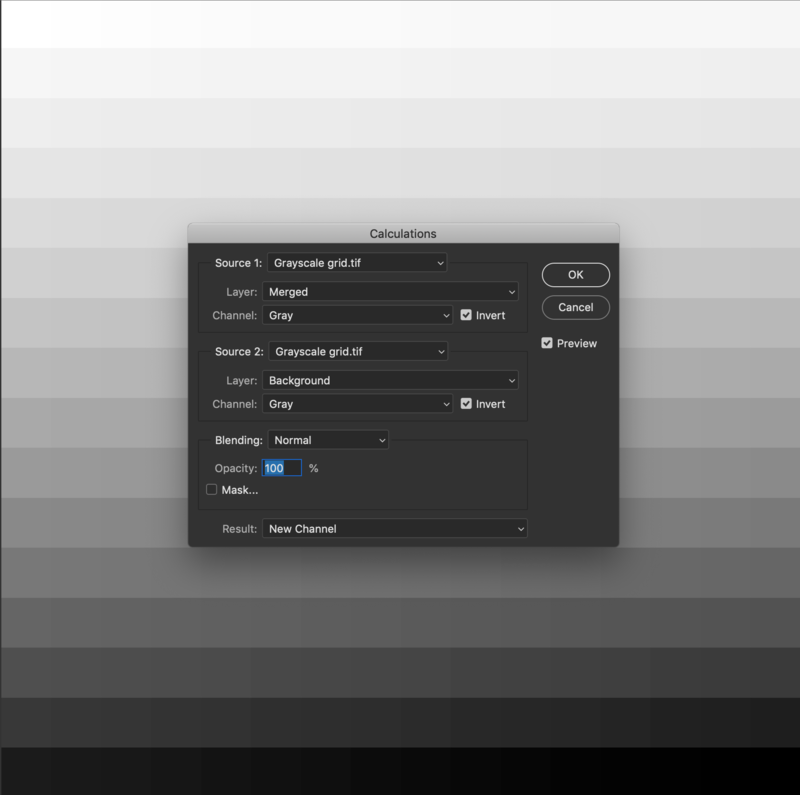 Once a selection is loaded and is saved, it basically becomes an 8 bits mask since a selection is always 8 bits in Photoshop. 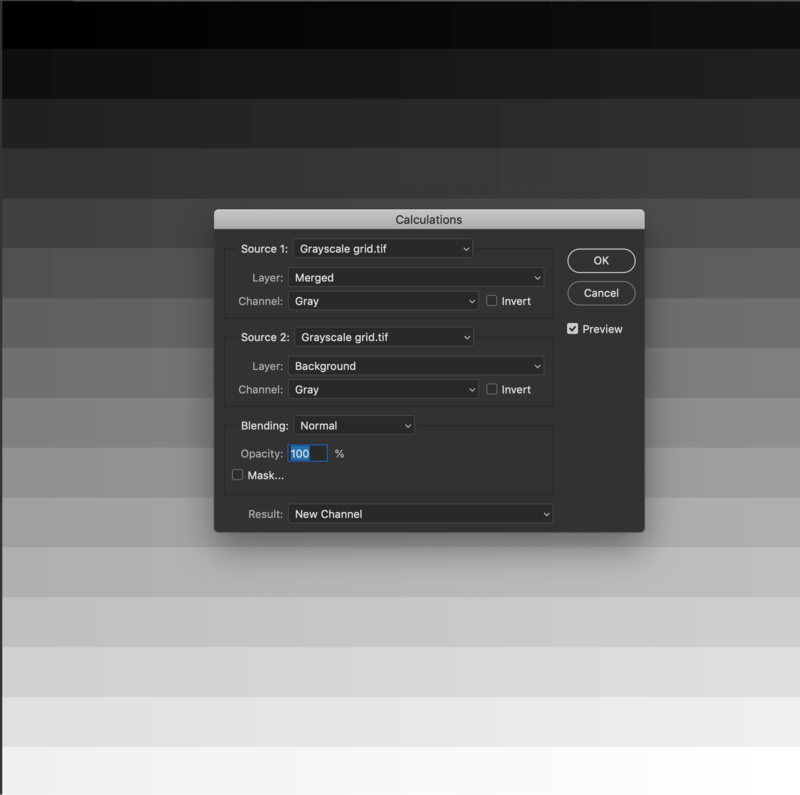 Other zones, or even extended, less restricted versions of that zone, can be derived and developed from the method demonstrated here for this specific mask using lighter luminosity masks like Lights2.5 instead of Lights3.5 I’m using for this mask. It takes a bit of trial and error and also quite some work as you always need a grayscale grid as used in my method to accurately isolate the zones when building the mask. 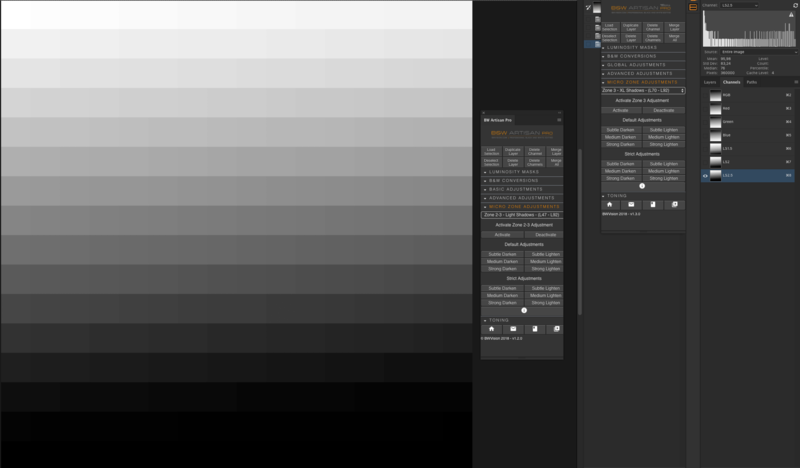 You can download the grayscale grid here. 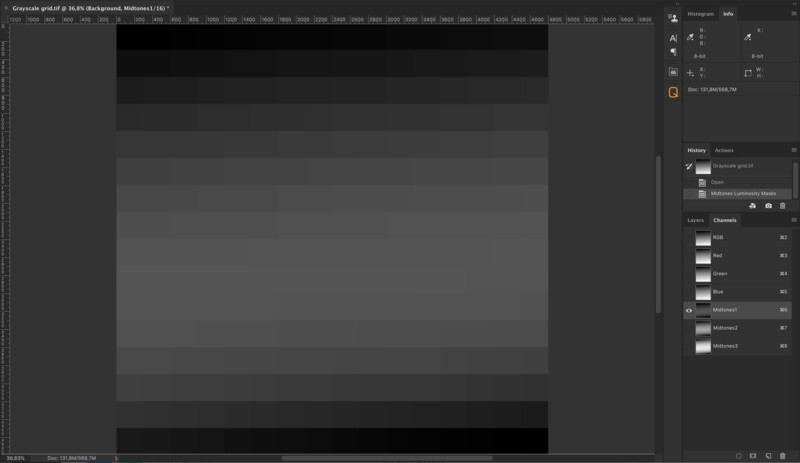 Step 1: Create a 16 bits Lights mask to ‘block out’ the zones darker than zone 3. 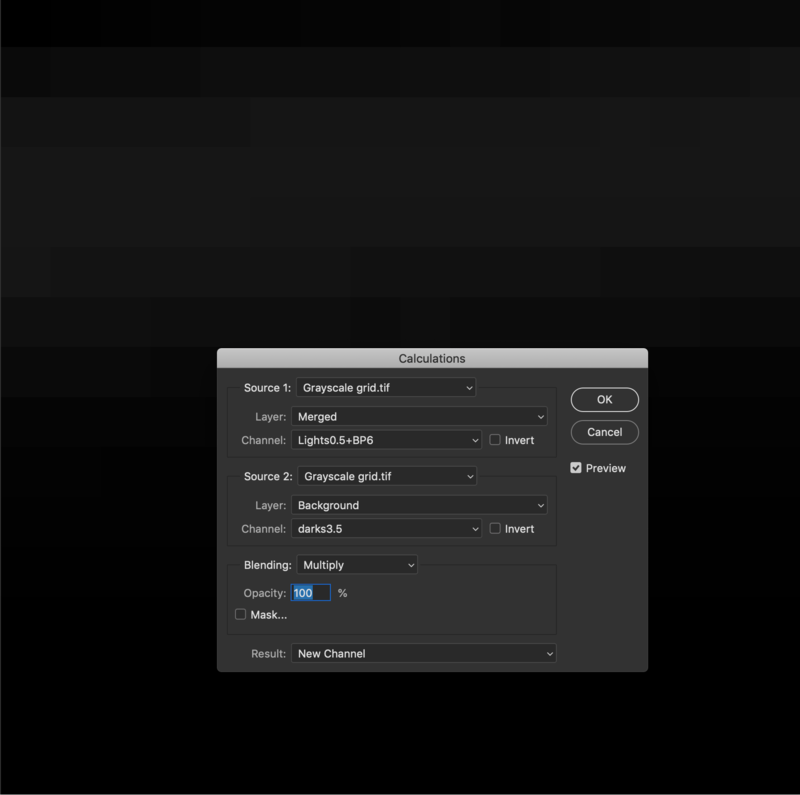 First create a Lights1 luminosity mask that will block zone 0. You will need to modify that Lights1 mask to ‘open up’ target zone 3 more. Go to Image> Calculations and select the settings as above to create this mask. Blending is set to normal. Click OK and it will then appear as an Alpha channel so give it a unique name. Step 2: Correct the mask. When standing on the created Alpha channel, go to levels and enter the settings above: Black Point 6 (to prevent zone 0 from getting too light), Gamma 1.25 (to basically make it a Lights0.5 mask), leave the White point as it is. You can see zone 3 becoming lighter. You’ve created a Lights0.5+BP6 mask. Step 4: Levels correction to make a Darks3.5 mask – the 16 bit way. Then stand on the darks mask (which came out of the Calculations as a Darks1 mask but was already named Darks3.5) go to Levels and set Gamma to 0.5 to create a Darks2 mask. See above. Repeat this once again to make it a Darks3 mask and then go for the 3rd time to Levels and now set Gamma to 0.75 to make it a Darks3.5 mask. 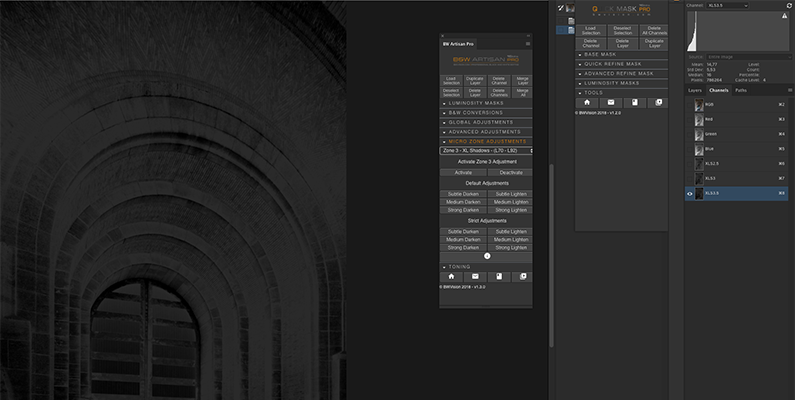 By doing this without selecting the RGB channel and saving it via selections, you create a 16 bits mask. 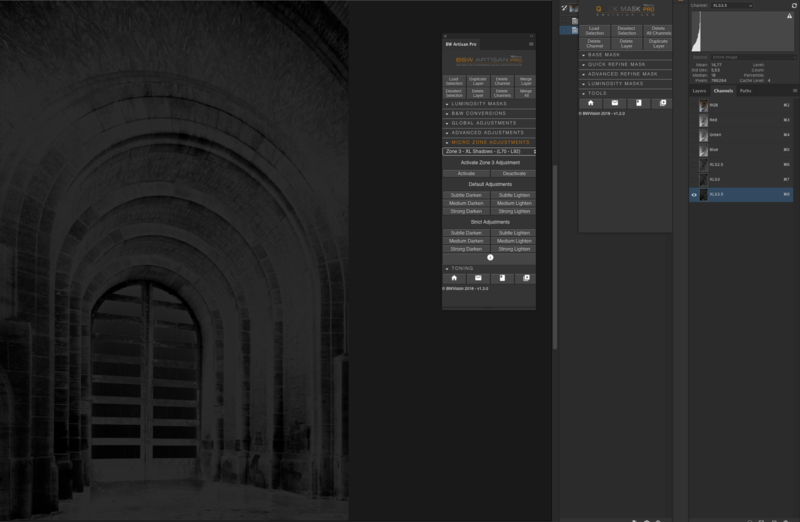 Step 4b: making a half value luminosity mask. Go for the 3rd time to Levels, while still standing on the same channel mask and now set Gamma to 0.75 to make it a Darks3.5 mask. 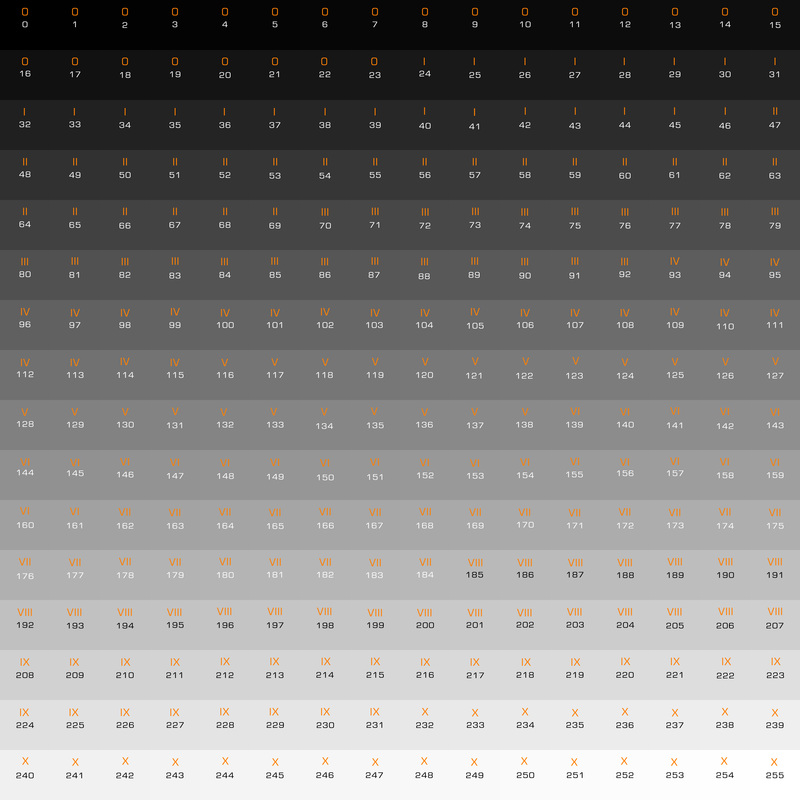 By doing this without selecting the RGB channel and saving it via selections, you create a 16 bits mask. As of now you have the Lights0.5 (Plus Blackpoint 6 correction) mask and the Darks3.5 16 bits masks. Finally navigate again to Image> Calculations and do as above: Select Lights0.5+BP6 mask and Darks3.5 and blending set to Multiply. 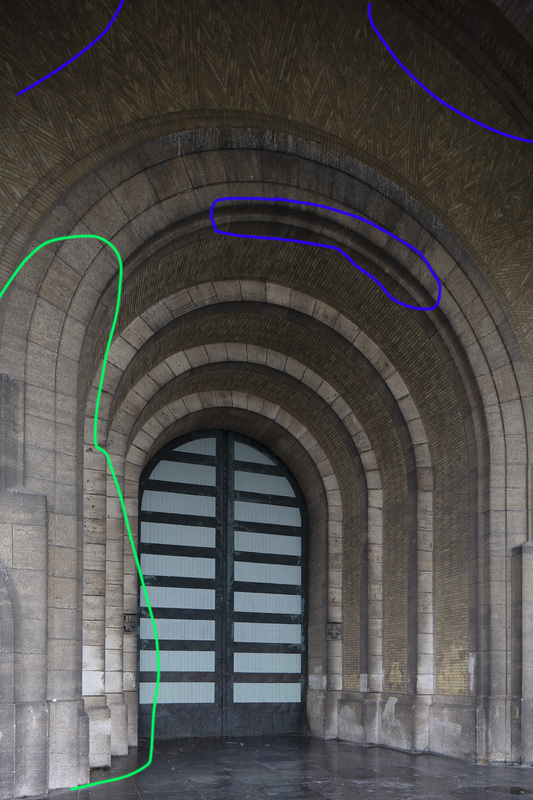 It basically is an intersection of both masks while retaining the 16 bits depth. After clicking OK it will be saved as a new alpha channel and give it a proper name. Repeat this with different ‘block out’ counter masks for all zones together with the lights or darks luminosity masks to ‘close in’ on a target zone. Usually the ‘block out’ masks are darks0.5, darks1 or darks1.5 for the Light asymmetrical masks (roughly all zones lighter than zone 5) and the ‘block out’ masks for the Dark asymmetrical masks (roughly zones darker than zone 5) are lights0.5, lights1 or lights1.5. To make it even more difficult: using those combinations will not always result in the accurate asymmetrical zone mask which means that you need to correct the result of the final calculation in this paragraph, with an additional Levels correction to fine-tune it even more and move the isolated zone up/down or left right to align it with the zone in the grayscale grid. It takes a lot of work and trial and error to create asymmetrical masks that accurately single out target zones without affecting adjacent zones. But the results are very subtle and satisfying. Alternatively, you can buy the panel that takes care of all that and automatically applies the mask in a practical situation (lightening/darkening) in a way that blends seamlessly with the rest of the photo in any area in the photo. Hello, thank you for your response: there are PDF’s with explanation, also updated explanations that you can access through the manuals button in the panel. Know that I’ve received many feedback that most users prefer video instructions and that your request for a PDF instruction is actually quite rare and for that reason the most extensive explanations can be found in the videos (16 in total and more coming up this weekend). Also most of the new features can only be explained clearly over video. It is a consideration towards video, but to say there’s no PDF on the new panel is pertinently incorrect. Both panels (B&W Artisan Pro and Quick Mask Pro) are outstanding and impressive. They are very intuitive and well organised. Even their design and appearance is beautiful. Best quality without rival. Very good job, Joel. As there have been a couple of significant updates on the original panel, I was wondering if you’ve any plans on doing another tutorial incorporating the new addition’s? Tim, yes I have a new video tutorial in the making that should go live this week. Expect at least 2 videos before the end of the year.